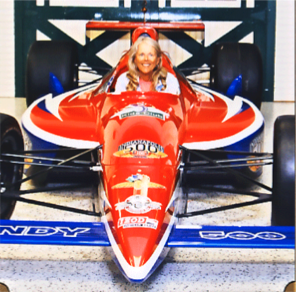 The Thursday tour stopped at the Indianapolis Speedway Hall of Fame Museum. Here Lorraine Bailey gets all revved up. After the museum it was off the Achgill residence for BBQ, music and a mini cover auction. 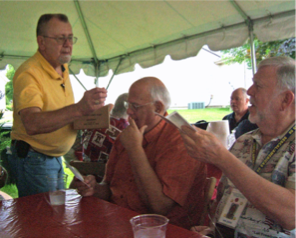 Cookout host Ralph Achgill distributes covers commemorating the day's events to Doug Kelsey and Bob Lewin. Friday night's President Banquet was well attended. 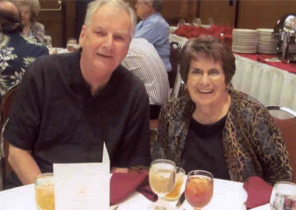 Enjoying the company of fellow AFDCSers is Mary Kay Fisher and husband Leonard. 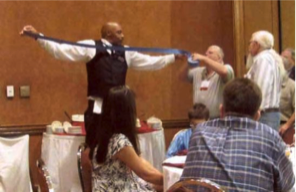 A banquet tradition is the "wingspan" raffle. To purchase the most tickets for $20, one must find the person with the longest arms. Here a waiter who filled the bill was pressed into duty. After dinner, winners of the Cachetmakers Contest were announced. Tom Peluso's Year of the Tiger cover nabbed the Top Cachet of 2010 award. Also receving an award for a Year of the Tiger FDC was Arianna and Ian Calle, shown here receiving their plaque from AFDCS President Lloyd de Vries. 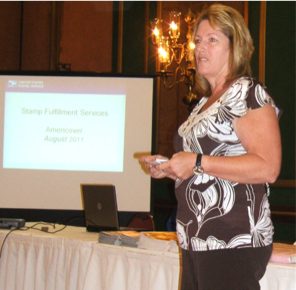 Betty Brown from the Postal Service gave everyone an update on new products for collectors the USPS is developing. Betty also promised to do her best to get a first day ceremony at next year's convention. After her presentation and a question and answer session, Betty provided all attendees with a beautiful book featuring national parks and stamps that depict them. The Cachetmakers Bourse is always a highlight of the show. Here Dave Bennett greets a customer. Art Kober's table was also a popular destination. 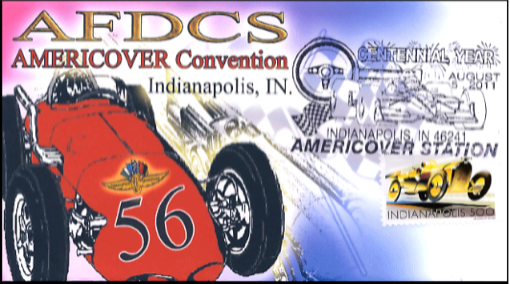 AMERICOVER means the best in first day cover exhibits. 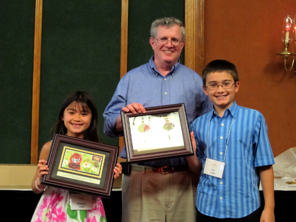 This year's Grand Award, pictured at left, was won by Andrew McFarlane for his exhibit on the 1947 Postage Stamp Centennial stamp. 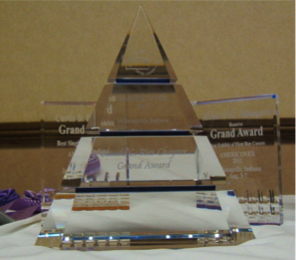 The Grand Award was sponsored by the Claude C. Ries Chapter of California. 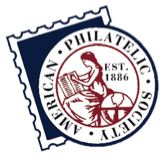 For complete palmares, click here. 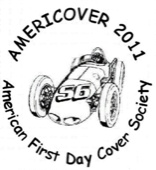 AMERICOVER also means the best in first day cover shopping. 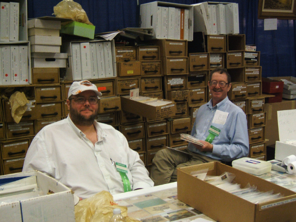 Bourse dealers Andrew and Bob Patkin were among the many dealers who were happy to help collectors find just what they wanted. AFDCS President Lloyd de Vries presides over the Membership Meeting, giving members an update on the state of the society. 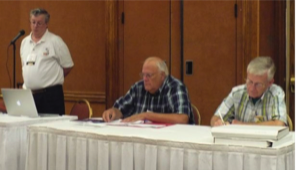 Seated next to Lloyd is Executive Director Doug Kelsey and Recording Secretary Ralph Nafziger. 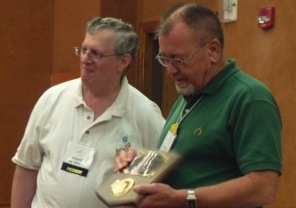 AMERICOVER Bourse Chairman Ralph Achgill was the recipient of the AFDCS Distinguished Service Award. The DSA is the second-highest honor bestowed by the society. Achgill was visibly moved when presented the award. 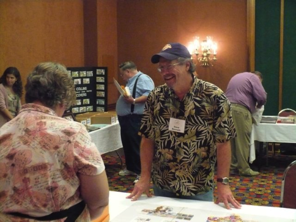 Fund raising auctions were very successful this year. 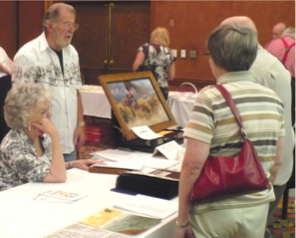 The AFDCS Donation Auction raised more than $2,600, while the Hospitality Suite Silent Auction netted almost $2,800. 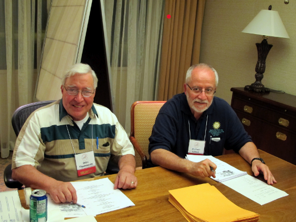 Here Otto Thamasett and Michael Litvak determine the winning bids in the Silent Auction. 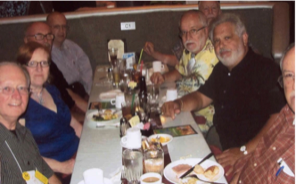 The last event of the convention was a show at the Beef & Boards dinner theatre. AFDCSers enjoyed Church Ladies 2: A Second Helping before departing Indianapolis. See you next year in California!